February has been for me a kaleidoscope month of Religious. Religious is an odd term, especially perhaps to younger people. Aren’t we all religious in some sense? Why the capital R? It is a nickname for men and women who belong to Religious Orders (Marist Brothers, Capuchin Friars, Compassion Sisters etc). While each Order has its own distinctive flavour or spiritualty or charism, a common kaupapa is found in them all: people uniting together in prayer and spirit in order to go forth and serve. 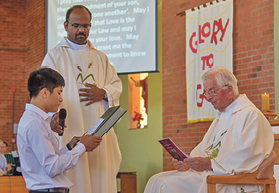 Four Sundays ago, I presided at the Mass of Reception of Khuong Nguyen as a Postulant with the Institute of Charity or Rosminians. It was a fantastic parish celebration at St Mary’s Palmerston North. Fr Michael Hill IC of Dunedin received Khuong on behalf of the Provincial Fr Joe O’Reilly based in Dublin. In his fine homily, Fr Michael spoke of Rosminians’ deep-seated letting go of all personal preferences in order to embrace any work of charity asked of them. Then, three weekends ago I was in Melbourne to witness the first Vows of Karen Engelbretson with the Sisters of the Cross and Passion. Karen was a member of the Young Adults group at the Cathedral parish here in Palmy and came to know the Sisters through the Passionist Family Movement. Their foundress, Elizabeth Prout, was a sleeves-rolled-up woman who trudged the wretched alleyways of industrial Manchester in the 1850s, visiting the sick and poor, and teaching in the mills and factories. Next was the turn of the Dominicans, when we fare-welled Sr Maureen O’Hanlon OP from the Diocese. Though tinged with sadness, the Mass at which were present many from the Deaf community was an occasion of deep gratitude for the work of the Sisters over the years, including the Boarding school for the Deaf at Feilding. The tributes paid to Sr Maureen were among the most heart-felt I have ever heard. This week I had a captivating conversation with an elderly Marist Brother. His was a simple, humble, generous offer. ‘Might two of us oldies, no longer fit for the classroom, come and do whatever we can among the people in one of your smaller towns?’ Wow. Reaching outwards, at a stage of life when one might be tempted to withdraw. Some question or even dismiss the relevance of Religious Life today. Such doubts though are often, I think, a smoke screen to hide something else: perhaps shame at having pursued the comfortable or controllable; perhaps a reluctance to entrust one’s future to the Holy Spirit and wisdom of others; perhaps a blindness to seeing small humble gestures and steps as something great; perhaps a muddling of the spectacular for the worthwhile. In the first reading of the second Sunday of Lent, we hear and watch God testing Abraham twice. ‘Here I am’ is Abraham’s response to God’s first call. Then, as though giving Abraham a chance to run away, God calls him again and Abraham repeats his response ‘Here I am’. A response expressing not a location but complete availability. ‘Here I am’ leads not to a mapped-out life but to a life of adventure. Religious Life is not a single ‘Hear I am’ but many, uttered in response to changing needs. To Khuong and Karen I say on behalf of so many, thank you for your courage. To Sister Maureen and Brother Humphrey I say thanks for warming my heart. To all our Religious, thank you for your constant witness to the breadth and depth of God’s vision for our world.